Decades ago, Honda branched out into upscale vehicles. It has long had a reputation for quick cars too. But at its core, the Japanese automaker is still widely regarded as a leading manufacturer of practical economy vehicles. I reacquainted myself with that legacy during a week with the 2018 Honda Fit Sport. The overall body style has not changed appreciably since it was introduced in the 2000s. The Sport model I drove sits in the middle of the five trim levels available. A front lower spoiler from which fog lights peek out sits at the beginning of the eye’s journey, leading up the short front grill, backwards along a steeply raked hood and windshield to a high roof. Hood and roof taken together create the impression of a wedge. The rear roofline spoiler sits over a fairly vertical rear window and hatch door. 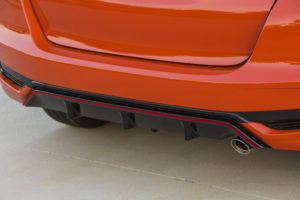 A rear exhaust finisher, rear diffuser and side sill garnish also distinguish the Sport from its stablemates. The sporty touches do little to block the impression that the car’s width and height seem about the same. The dimensions suggest that the Fit is a tiny van. While that might not sound appealing to the vain among us, I liked it. The Fit wears its practicality on its sleeve. Step inside this Fit and you could mistake it for a model several years old. Like the exterior, Honda hasn’t substantially updated the interior for years, choosing to retain the overall “budget” feel. For people interested in a reliable few-frills runabout, this is a good thing. Unfortunately, the Fit’s seats don’t fit (unintentional pun) me. There’s loads of headroom, a frequent complaint for those of us above six feet tall. (Thank you Honda for not putting a moonroof on my tester.) Here, there wasn’t enough room for my legs. I could not put the seat back far enough to have my thighs rest comfortably on the seat. This caused me a little extra fatigue during longer trips. 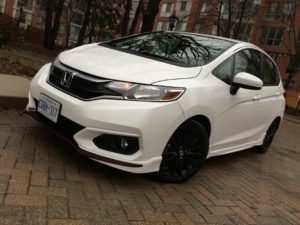 I had the same experience during my review of a 2015 Fit and Honda hasn’t changed this (yet). I suppose enough shorter car buyers snap up Fits, and Honda hasn’t seen the need to cater to us “oversize” fans of budget vehicles. Pity. The Sport’s interior isn’t entirely plain. Red stitching on the shift knob’s black leather make it look a little like a tiny baseball. That red stitching matched similar stitching on the leather-wrapped steering wheel and designs on the heated front seats. The rear seats offer just enough headroom for me, thanks largely to the car’s boxy van shape. There’s just enough room for my bag and a large briefcase beside it. The bag did not push up the privacy cover, a testament to the depth of this hatch. My sticks slid easily over the backs of the folding rear seats. I suspect Fit owners surprise people when they haul more stuff in their cars than they seem to have a right to. A deep hatch, high roof and folding rear seats combine to form an amazingly cavernous space. Plug in your smartphone and you can have the touchscreen taken over by Apple CarPlay or Android Auto. The 180-watt AM/FM 6-speaker audio system offers decent audio quality. Siri Eyes Free compatibility adds to the CarPlay experience. You can tether your phone to the Fit using WiFi to access other applications. The information display at the right side of the instrument cluster is bare-bones and legible. I was surprised to find no controls on the steering wheel to choose what information to view there. A quick read of the owner’s manual told me I need to press the select/reset knob on the instrument cluster itself (i.e. reach around the steering wheel and lean forward) to toggle from trip information to fuel economy and so forth. This isn’t the easiest thing to do with a vehicle in motion, when you’re most likely to want to switch between displays. Honda offers a USB port under the centre stack and another in the centre storage unit, where you can keep charging devices out of site. Honda’s 1.5-litre, 16-valve, i-VTEC® 4-cylinder strikes a great balance between peppiness and fuel economy. Mated to a 6-speed manual transmission, you can rev the Fit up to its 130-horsepower limit, enjoy 114 lb-ft of torque and get this lightweight hatchback off to quick starts. CVT-equipped Fits enjoy slightly lower performance numbers. In either case, the engine gets your input using a drive-by-wire throttle system. As you would expect on this compact car, Honda’s Eco Assist ships standard on all models. The Sport (and lower trim levels) ship with actual ignition keys. Push-button start is reserved for the EX models. The Fit’s tall stance may be great for headroom, but given its shortish and narrow wheelbase, I felt some lean when briskly accelerating on curving highway on-ramps. Not that the Fit ever felt unstable. Vehicle Stability Assist and Traction Control ship standard on all Fits. CVT-equipped models offer more advanced active safety features like a collision mitigation braking system, forward collision warning system and lane departure warning system. They also get adaptive cruise control and Honda’s Lanewatch blind spot display. City driving is where the Fit truly shines. Think a parking spot might be too tight? Give it a try. Need to make a tight turn? Check your blind spots, and when the coast is clear, go ahead. In town, this small package held great things. 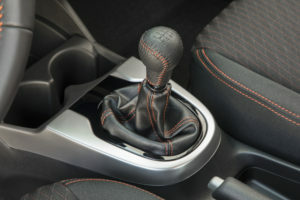 Honda publishes city/highway/combined numbers of 8.1/6.6/7.4 for the manual transmission model I tested. CVT numbers are a little better. The Fit takes regular fuel in its 40L tank. Back in the 90s, I drove a Honda Civic 4-door hatchback several times. 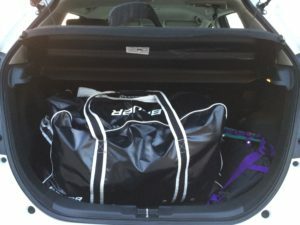 That was a great vehicle given all the stuff and people my friends and I crammed into it. That model has long since been discontinued. But I’m grateful Honda keeps its spirit alive in the Fit. You can get into a 2018 Honda Fit for $15,190 MSRP. The Sport model I tested starts at just under $20,000 MSRP. Now that’s a classic Luigi review right there! I will not buy this car, but this is a classic review. The bag test is a staple. Absolutely classic. Luigi, my friend, you have done it again.